Where else can you get banana trees among wine grapes along perfectly manicured vineyards by a graceful elephant that is treated responsibly? The land of the never ending smiles is not known for its wines, for most of its production is consumed in the country, but a few innovative wineries have sprouted in the last two decades to challenge the preconceived idea that wines cannot grow at these New Latitudes. 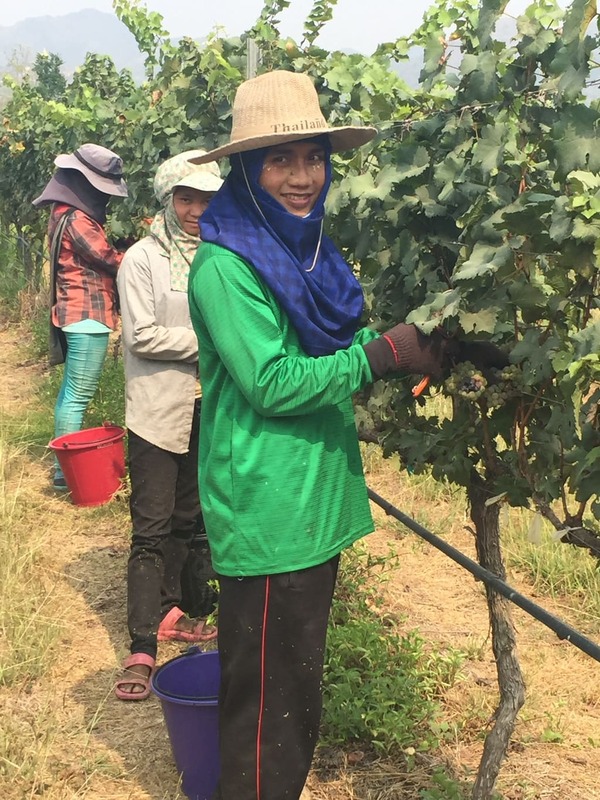 First, the most adventurous wine makers settled in the northern part of Bangkok but, the bravest, started experimenting with small plots of land in the hills behind Hua Hin, on the Gulf of Thailand where rain is less frequent. After having visited the wineries in Khao Yai I felt that a trip to Hua Hin Hills Vineyards was in order. 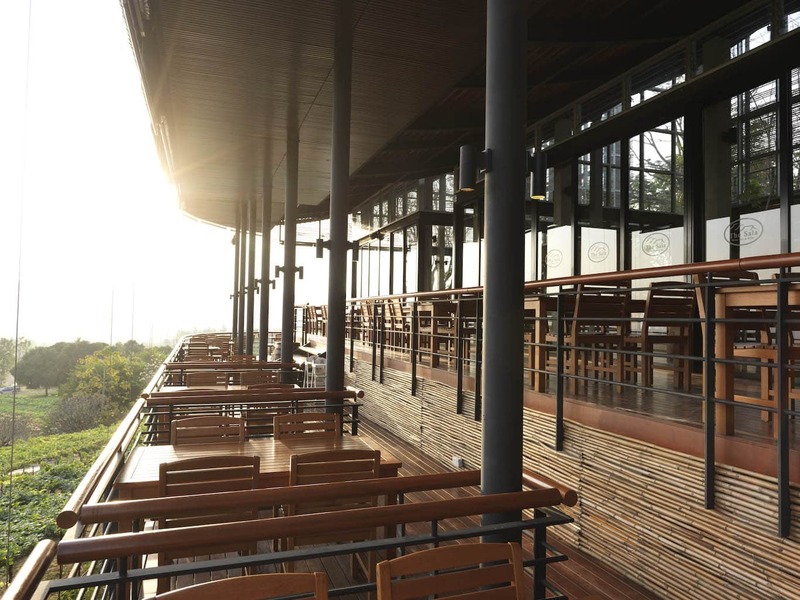 Hua Hin Hills Vineyard is just the center of the grape growing efforts from Siam Winery but the winery itself is located 45min outside of Bangkok. On our way to the vineyards we stopped at the wine making facility. My visit was well timed for the end of the harvest season which extends slightly longer than in Khao Yai because the rainy season starts a bit later in the hot hills of Hua Hin. As we arrive in the winery we are shown a couple of videos about the history of Siam Wines. Siam Wines experimented with vine growing on a tiny plot of land granted by the King. After much trial and testing a few varieties were found to grow lushly in the terrain. Columbar and Sangiovese seem to be flourishing strongly in the soil thriving in a weather that is extremely dry during certain months and completely wet in others. It is this extreme variability in the weather pattern that makes it so hard to grow grapes. In this terrain, the vines would sprout three times a year if left to their own devices making their life one third of the usual lifespan in the Old World as they are working three times harder. 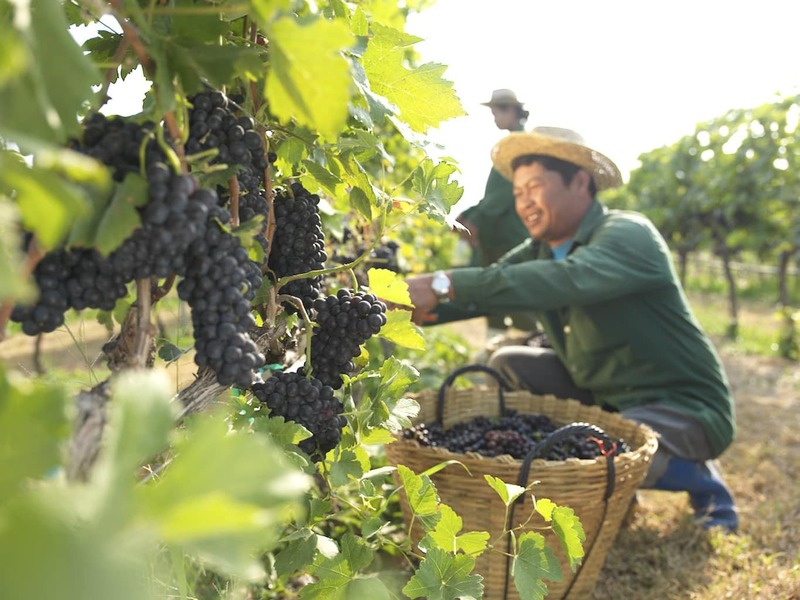 However, Siam Wines decides to only harvest once as it would not be possible to do so during the rainy season anyway and the grapes would be of lower quality. The winery is busy receiving a delivery from the vineyards. I am surprised to see the grapes coming in carefully stacked crates and kept in a refrigerated truck all the way from the vineyards. In the popular summer months the roads can become very busy with traffic, as I later discover on our way back to Bangkok, so the quality needs to be preserved via refrigeration in order to protect the delicate fruit from the extraordinarily steaming Thai weather. Red syrah grapes are being poured into a conveyor belt. The seeds and skin are placed with the grapes in steel tanks for maceration. The operation is manual and done with a lot of care, taking as long as is required. We move into the bottling section of the warehouse where hundreds of bottles are being washed, dried, labelled and filled with the liquid of the Gods. Staring at this process is mesmerizing and enchanting, I feel like someone has thrown a spell at me as I get lost in the chain of bottles, labels, caps and seals quickly passing through my eyes. I always loved staring at these constant and perfectly timed manufacturing chains. I am quickly transported to my childhood when I used to stare at the grapes being brought in and taken inside the wine press in a spiral that never seemed to end. A fascinating optical illusion. But the proof is in the pudding so, after seeing the facilities and touring around as if we were at home, we get to sample some of the wines, although most of the tasting will happen at the vineyards where we are heading next. Back in our comfortable van we fall asleep to the lullaby of the car’s engine and when I open my eyes next the driver has pulled off at a petrol station wondering if we are hungry – actually, he was the one who wanted to grab some food and although we initially decline we ended up getting out and buying some provisions. Kate gets a coconut too, how authentic. Where else can you drink a fresh coconut on your way to a winery? Eventually we arrive at Hua Hin Hills Vineyard. The restaurant I had seen on photos to many times is even more impressive in person. It is smartly located on top of a small hill with views over the vineyards and across the valley. In the distance, I see a golden pagoda, a Buddhist Temple in the horizon as if standing tall to protect the entire area. It is a reminder that we are in Thailand, easy to forget when you look around you 360 degrees and all you see are vineyards. We are greeted by the wonderful Koi who takes excellent care of us for the entire journey. The sun is up in the sky and burning our shoulders, it is extremely hot, reaching over 40 degrees Celsius at lunch time as we head out after a refreshing glass of grape juice while we take in the views over the vineyards. The restaurant, Sala Wine Bar and Bistro, is fantastic, open structure split into various levels, it feels airy and breezy, what a fabulous way to spend a weekend day, I cant think of a more pleasant way. Hua Hin Hills Vineyard offers a variety of activities including bottle painting for the little ones and more adventurous jeep tours, on a WWII Jeep no less, across the vineyards. We jump right up and sit on this piece of history as we throttle across the dusty paths between the vineyards. We are joined by one of the wine consultants Siam Wines has on staff to help the house winemaker with the new experiments and research. As it is late March the harvest is in full swing and already slowing down but the vines are full of grapes oozing sweetness and summertime. We jump off a few times to get closer to the perfectly lined up vines. Hua Hin is experimenting with the V shape growing popular of India, so that the vines can more evenly enjoy the sun rays that shine so high up in the Equatorial sky. The soil does look like it is ready for the rainy season to arrive. A team of grape picking staff are swiping along some of the vineyards carefully selecting the grapes that are ready for harvest and placing them in the plastic crates we saw at the winery. We get a hold of one of their pairs of scissors, the exact same ones I used to hold for summers on end back home, when I was still a child and wanted to help out. We do look like the tourists have just arrived but if I close my eyes I feel like I have shed 20 years. The joys of farm work. The most beautiful of all the activities on offer is a short tour of the vineyards on an elephant. This is not just a marketing ploy but also a rendition to the history of the area. The vineyard restaurant is currently built on what was an elephant corral. I am always very weary of these publicity stunts and animal circuses, nothing breaks my heart more than animals being abused and I am never too inclined to participate in activities where animals are used as entertainment, the ever so impossible-to-answer conservation question that travelers continuously face. So, before visiting, I was not sure I would want to partake on this and I certainly wanted to know more about how the animals are treated. However, when graceful Fatty came along all I could see was how much she loved her taker and what a great relationship they both had. At that moment I knew that it was all ok.
Koi tells us that they stopped the elephant tours for a few months, I had read about it online, because the company who used to take care of this did not treat the animals well. Fatty did seem, urg, fat and healthy. We hopped on top on a very padded seat and spread on either side for a new perspective on the vineyards. This was an utterly hilarious moment. She walked along the paths throwing us from side to side, I think Fatty really wanted to have a laugh with us. I could not stop grinning until, all of a sudden, to add the cherry to the cake, she decided that it was too hot and so put her trunk in her mouth, swallowed saliva and then splashed it on her body, only that I was right on top of her so I got showered too. This was possibly one of the funniest moments in my traveling life: being spit on by a hot elephant on a winery in Thailand. I just could not stop laughing. Fatty had a very interesting way to show us her hospitality. This was a very nice way to see the vineyards and a highlight of our visit. Where else can you walk along the vineyards on an elephant? To thank Fatty we got a bunch of bananas and fed her. She was extremely gentle and very polite, grabbing each banana as we placed them on her trunk, patiently waiting for me to grab the next one. She threatened to spit on me again but quickly realized that a real bath was awaiting her once the bananas would be finished. She seemed very happy about that and I can’t blame her, the temperature was becoming truly unbearable as we were chilling under a mango tree. 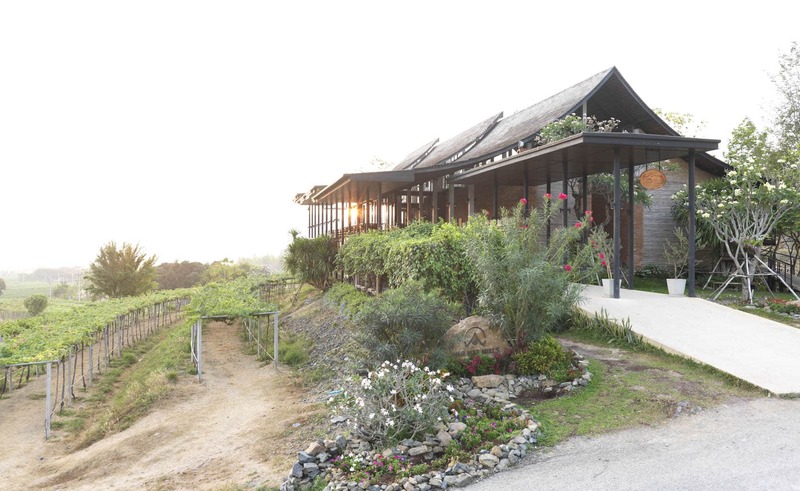 Hua Hin Hills Vineyard is a refreshing take on Old World Winemaking. Instead of the peach and apricot trees we have back home the vineyards are dotted with mango and papaya trees and the odd banana tree grows wildly along the paths where in Spain we would have pomegranates. It is as beautiful as it is a feat, to grow wines in such arid and at the same time wet terrain. Yields are very high on some of the varieties – 2015 will be a great year! After our tour we enjoyed the most delicious tapas and wine pairing back at Sala. The setting sure has a way of making you feel like you are sitting on your own veranda, on a summer evening. Siam Wines exports about 30% of their production and, the wines have become so popular that they were out of stock of several of the wines. Their tapas and wine pairing, although not necessarily featuring Thai dishes only, is a very successful way of tasting their wines with the most fabulous creations. The dishes, served in smaller sampling portions, are exquisitely presented and match the wines to perfection. Just like other Thai wineries the Monsoon range of wines, is relatively sweet and fresh with very tame tannins and acidity, making them the perfect companion for Thailand’s spicy and rich flavors. I am in Wine Heaven. The breeze is blowing and a strategically placed fan is providing the much welcomed wind. We savor a subtle crab and apple timbale with the Monsoon Valley Colombard white. The wine consultant told us that Colombard is growing very successfully on the property and we could see some of the vines exploding with great yields of the variety. As an offspring of the Chenin Blanc it does not surprise me that it is growing so happily on site. I had never tried a 100% Colombard wine but I must say that its pairing with the food was just beautiful. The bountiful Thai waters produce excellent seafood so a fried river prawn with Panaeng sauce is an expected staple yet the chef has managed to give it an absolutely rounded flavor. Within a second of biting into the tender meat I find myself leaking my fingers and hunting for more of this treasure among the shell. The wine pairing brings out the star wine, their Monsoon Chenin Blanc, a middle sweet wine that just goes perfectly well with any Thai dish. We are told that when chefs from all over try to pair Thai food they always veer towards this one. The elegance of the Chenin Blanc, the most popular variety of whites grown in New Latitude Winemaking areas, is a fantastic companion to the types of rich and spicy foods that are usually eaten in these geographies. A balanced smoked duck breast with tamarind nam prick is a delightfully soft cut. The tamarind sauce, so common of Thai food, gives the traditional French meat a tropical twist. As wine knowledge dictates, we are offered a glass of Shiraz to go with it. It seems that the Shiraz is one of the best varieties in Hua Hin, together with the Sangiovese. I find it a soft red which is a welcome drink for the hot climate. A deep and strong french Burgundy would not go well with the ambience and the food. The wines so incredibly complement the food that I am sure the chef designed the creations to pair with the wine. 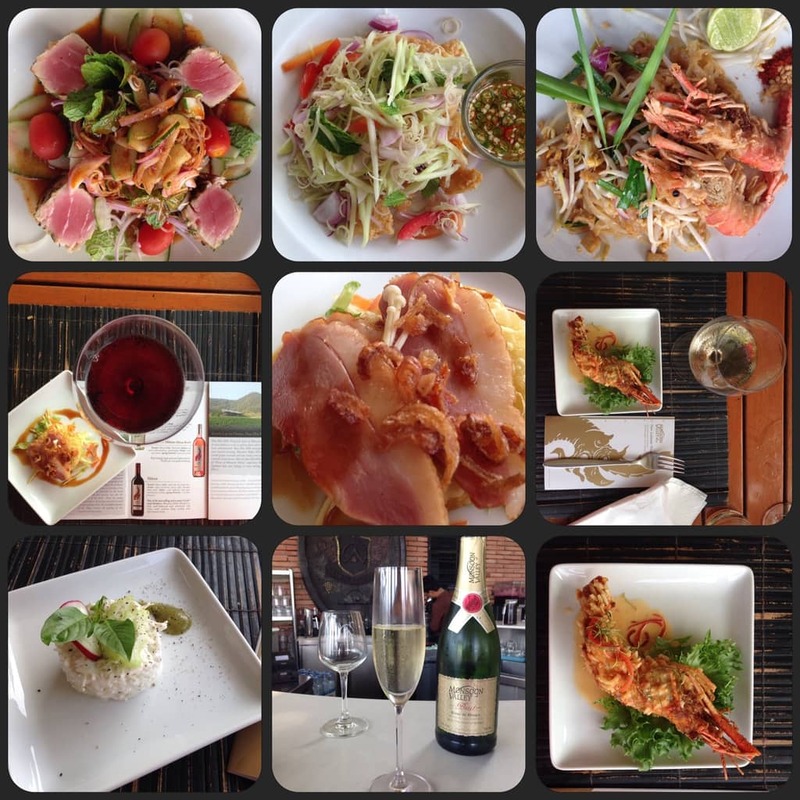 After the tapas we are curious to try the Thai specialties and the Chef signature dishes on the menu so we add a Pad Thai, a Tom Yum Tuna Loin that Koi recommends us and the Winemaker’s favorite dish, the crispy snapper on a mango salad. They are all fabulous dishes, and we repeat some more of the Chenin Blanc because, well, it just goes well with anything! Siam Wines has a young German Winemaker as their in-house professional and has tried over 150 varieties of grapes on site. Experimenting and trying new variations as well as their own, is part of the research that is required when you are trying to go against nature. If customers are to speak out, Siam Wines has been extremely successful. The most popular wines, including the reserves, are sold out months before the new season will be available on the shelves, a sign that they must be doing something right. The formula at the vineyard is also a winner. Although you get less of the winemaking feel, the setting, the views and the food are the definition of a wonderful day out. And even if the wines are hard to compare to Old World Wines because of the winemaking process and the poor soil, they are the perfect match for Thai and other Asian dishes. Don’t be shy and open your mind to a new latitude in winemaking.